Investigate a dragon sighting near Whiterun. Dragon attack at the Western Watchtower! Meet Irileth near the Western Watchtower. (Optional) Use your new Shout power. Report back to Jarl Balgruuf. Shortly after you return the Dragonstone to Farengar, Irileth will approach to inform him that there has been a sighting of a dragon at Whiterun's Western Watchtower not far west of the city. Irileth will then ask Farengar and you to meet with Jarl Balgruuf. Follow them there, where a somewhat unnerved Whiterun guard will recount seeing a dragon flying over the watchtower. Balgruuf will ask you to accompany Irileth, as she goes to investigate and, if necessary, do battle. She will recruit several Whiterun Guards along the way. "No! Get back! It's still here somewhere! Hroki and Tor just got grabbed when they tried to make a run for it!" Follow Irileth to the Guard Barracks just inside the city gates. After she delivers a speech to rally her soldiers, follow them west towards the tower. 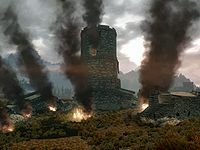 You will gather near the road close to the watchtower to find the watchtower burned and smoking, evidently signs of a recent attack by a dragon. After a short talk, Irileth will give orders to search for survivors. On the north side of the tower, on or around the ramp leading to the interior, you will encounter the lone surviving Whiterun Guard, stammering about what he's just experienced. Shortly after hearing this, you will hear several warnings that the dragon has returned. Irileth will advise taking cover against the dragon's attacks and to "make every arrow count". The dragon, Mirmulnir, will approach from the south and will immediately begin attacking the group. Use dragon combat strategies during the battle. He will land, fight, and then fly off after losing about a quarter of his health. Once further wounded, he will remain on the ground. While at a level of around 20 or lower, Mirmulnir will be a dragon that uses fire attacks, is resistant to fire damage, and is weak against frost damage. Ranged weapons, frost or shock attacks, and melee weapons will be effective choices. If you play this quest at higher levels, Mirmulnir may attack with frost. When in the air, the dragon will use shouts, typically Fire Breath, against you, the others, and any other living creature who may happen to be in the area. Dragons are indiscriminate in their attacks, so the presence of multiple targets should relieve you of some of the onslaught. He may also use the somewhat more powerful Fireball shout. When his attention is focused elsewhere, attack with a ranged weapon or spell. If he begins to aim his face toward you while in the air, seek cover to shield you against the powerful shout that will ensue. If you get inside the watchtower, or near its door, you can effectively use its walls for this, and then step back out, or use a window or doorway to counter-attack when his shout has dissipated. When on the ground, Mirmulnir uses both physical and magic attacks. If facing you from a moderate distance, he will use his Thu'um (shouts) against you, as long as you are in his line of sight. When up-close, he will attack frontally with his jaws. If you are behind him, he will beat his tail on the ground, trying to hit you. Both of these types of attacks deal heavy physical damage. The dragon's wing attacks, while very strong, are the least powerful of his physical attacks. When the dragon is in the air, attack at every safe opportunity until he is forced to land. When he's on the ground, the best approach is from the side. Irileth is also useful in this fight. As an essential character in the game, she can be weakened but not killed in the attacks. Once killed, Mirmulnir will explode in flames and then release his soul in a blast of energy. As the Dovahkiin (or "Dragonborn"), the dragon's soul will enter your body, automatically unlocking the first word of the Unrelenting Force shout, which you learned previously during the Bleak Falls Barrow quest. After witnessing you consume the dragon's soul, a nearby guard will engage you in dialogue and exclaim that you are Dragonborn. Some of the other surviving guards will express their skepticism. Irileth will discard the notion as a myth and order you to report back to the jarl. One guard will remark that if you are Dragonborn, you can shout, and ask if you've tried. You can use your shout at this time, completing the optional quest objective, or leave them wondering. Search the dragon's body, taking dragon bones and dragon scales along with other loot. These can be used to forge and improve dragonbone and dragonscale armor and weaponsDG once your Smithing skills are highly advanced. In the lengthy intervening period, you can sell these valuable items. Search in and around the tower for any loot you can take from dead guards. As you make your way back to Whiterun (note that the Dragonsreach marker will vanish temporarily during this quest), you should hear thundering voices boom out "DOVAHKIIN! ", reverberate across the sky. Return to Dragonsreach and report to Jarl Balgruuf. He will ask you to recount events at the watchtower and then conclude that the voices were the Greybeards, "masters of the way of the Voice", summoning you to their secluded mountain peak residence at High Hrothgar. The jarl will inform you that the greybeards can teach you to use your gift. The jarl advises you to travel to the Greybeards immediately, as their summons is a "great honor". During your exchange with the jarl, his brother Hrongar will counsel confidence in you as the Dragonborn, in a calm debate with Proventus Avenicci, the jarl's Steward, who openly expresses suspicion and skepticism toward you. For your assistance in slaying the dragon, the jarl will appoint you Thane of Whiterun, which entitles you to a personal housecarl, Lydia. She will reside at Dragonsreach until you purchase Breezehome, at which point she will move in with you. Balgruuf will also reward you with the Axe of Whiterun as your symbol of office. The axe is a leveled weapon that carries a random enchantment effect. 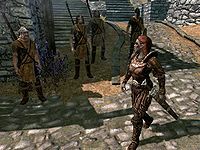 Lydia will greet you if you head toward the front door of Dragonsreach, at which point you can make her a follower by telling her that you need her help. 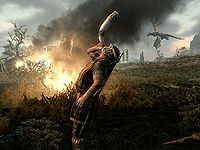 Dunmer or Nord player characters will enjoy an advantage in the dragon fight, depending on whether Mirmulnir uses fire or frost attacks. If Mirmulnir uses fire breath, Dunmer characters will take only half damage due to their racial fire resistance. If Mirmulnir uses frost attacks, Nords will instead have this advantage. You can hide in the tower and let the guards take care of the dragon. Because Irileth is essential, they will always win. However, casualties will be high. Once Mirmulnir is dead, other dragons will begin appearing in Skyrim. The Axe of Whiterun is generated in Jarl Balgruuf's inventory when you give Farengar Secret-Fire the Dragonstone. You can take a look in the Jarl's inventory and reload to generate an axe with a different enchantment. If you don't already possess one, a weapon that carries a fire damage effect may be especially helpful if you plan to soon proceed to the next quest in the main quest line, The Way of the Voice. After defeating Mirmulnir, you will be unable to fast travel directly to Dragonsreach, as its map marker will be temporarily removed. The Whiterun city gates will still be available for fast travel. However, if you open the map quickly enough, you can still fast travel to Dragonsreach. If you don't return to Whiterun, the Greybeards will call you if you approach High Hrothgar. After 24 hours, they will call you no matter where you are, provided you're outdoors. The main quest line will progress normally, though Dragon Rising will remain in your quest log until you speak to Balgruuf. After finishing Bleak Falls Barrow by turning in the Dragonstone to Farengar, the quest Dragon Rising may fail to start. This appears to be caused by Irileth being completely missing in the game. You have to first enable her through the console (prid 0001a67f followed by enable), then place her at you while you are still in Dragonsreach (moveto player) and finally, advance the quest (setstage MQ104 10 then setstage MQ104 40). The quest rewards will be added to your inventory and Irileth will start running towards the tower. If you have a save before turning the Dragonstone to Farengar but no save of before getting the Dragonstone or simply Starting the Quest(Bleak Falls Barrow), get into Dragonsreach and type in the console (Completequest MQ104) which should indicate you the Bleak Falls Barrow is completed but it should be in your Quest menu ready to turn the Dragonstone to Farengar. Do turn the Dragonstone to Farengar which should complete it a second time and it should start Dragon Rising (Making Irileth storm in shouting stuff about Dragon). Lydia may fail to spawn properly upon completion of the quest. Once you purchase Breezehome and enter it, Lydia should spawn. The quest reward, the Axe of Whiterun, may not appear in your inventory. Irileth may not always appear. To fix this, wait in one hour increments and she should appear. With the Dragonborn add-on installed, it may be impossible to absorb the dragon soul. This can be worked around by entering setstage MQ104 90 into the console. Just as you defeat Mirmulnir, you'll see "Dovahkiin, No!" with subtitles enabled. However, no audio file exists for it. Similarly, you may see the following subtitles during battle: "You are brave. Balaan hokoron. Your defeat brings me honor. ", "Brit grah. I had forgotten what fine sport you mortals can provide! ", or "Thurri du hin sille ko Sovngarde!. This bug is fixed by version 1.2.5 of the Unofficial Skyrim Patch..
10 I recovered the Dragonstone from Bleak Falls Barrow, as the Jarl of Whiterun requested. I should speak to him about my reward. 13 A dragon has been sighted near Whiterun. Irileth, the Jarl's housecarl, asked me to come with her to discuss the situation with Jarl Balgruuf. 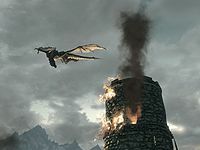 40 A dragon has been sighted at a watchtower near Whiterun. Jarl Balgruuf has sent me along with his housecarl Irileth with reinforcements. 80 A dragon was sighted at a watchtower near Whiterun. Jarl Balgruuf sent me along with his housecarl Irileth with reinforcements. The dragon attacked us and we killed it. We should investigate its corpse to see if we can learn anything about where it came from. 90 A dragon was sighted at a watchtower near Whiterun. Jarl Balgruuf sent me along with his housecarl Irileth with reinforcements. The dragon attacked us and we killed it. When I approached the dragon's corpse, I absorbed some kind of power from it. I should return to Whiterun and tell the Jarl what happened. 160 Finishes quest A dragon was sighted at a watchtower near Whiterun. Jarl Balgruuf sent me along with his housecarl Irileth with reinforcements. The dragon attacked us and we killed it. When I approached the dragon's corpse, I absorbed some kind of power from it. When I returned to Whiterun, the Jarl rewarded me for my services. I am now a Thane of Whiterun with my own personal housecarl. The following empty quest stages were omitted from the table: 0, 1, 12, 15, 20, 30, 45, 46, 48, 50, 52, 55, 60, 70, 85, 92, 95, 100, 105, 108, 110, 120, 130, 150, 170, 180, 200. On the PC, it is possible to use the console to advance through the quest by entering setstage MQ104 stage, where stage is the number of the stage you wish to complete. It is not possible to un-complete (i.e. go back) quest stages, but it is possible to clear all stages of the quest using resetquest MQ104. This page was last modified on 8 October 2018, at 17:51.